Wedding Planning 101: What Is a Preferred Vendor List? Home › Blog › Do I Need to Use My Venue's Preferred Vendor List? Do I Need to Use My Venue's Preferred Vendor List? If you and your fiancé have started looking at wedding venues, you've likely noticed that many of them advertise a "preferred vendor list." This list may include local photographers, videographers, florists, entertainers, bakers, officiants, limo rental companies, etc. – and at a quick glance, it may seem like your venue has helped you plan your whole wedding in one shot. But what exactly is a preferred vendor list, and what does it mean when a company appears on one? Most importantly, are you required to use vendors from your venue's list? These are some of most common questions engaged couples ask as they begin their vendor search, and some of them aren't always easy to answer. Here are some of the basics behind the concept of preferred vendor lists and what you should consider before booking your wedding service providers. Why do venues have a preferred vendor list? Venues often create preferred vendor lists with their own policies in mind. Some have restrictions about the third-party vendors that come in to work events, so the preferred vendor list makes it easy for couples to choose one that meets all the requirements. In fact, the venue may even require you to use certain vendors, such as their preferred caterer or cake baker, as part of your contract. Alternatively, the venue may charge a fee for using non-preferred vendors. In other cases, a preferred vendor list is simply a collection of wedding professionals recommended by the venue. These vendors have an established, positive relationship with the venue and may have paid for their spot on the "preferred" list. The venue might also receive a commission from their preferred vendors when couples book them. With this type of preferred list, couples are usually under no obligation to use the recommended vendors. Before you book your wedding venue, be sure to ask whether you would be contractually required to use certain providers. If the answer is yes, carefully consider whether you want to work with a venue that limits your vendor options. You don't want to fall in love with a wedding DJ company or videographer, only to find out the venue won't allow you to use them. Should I use preferred vendors? Assuming your venue doesn't require you to choose from their preferred vendor list, you should always explore all your options before going with the venue-recommended professionals. That being said, a preferred vendor list might be a good starting point for your own research if you're not sure where to begin. When evaluating preferred vendors, approach it the same way you would if you were looking for vendors on your own. Check out the vendor's website to get an idea of the work they do and the clientele they serve. Read online reviews and find out what other people have to say about working with them. Talk to them over the phone and in person to get a better idea of who the vendor is and how they approach their work. For example, if it's a videographer, ask them about their style of filming and how they typically edit wedding videos. For DJs, ask about the planning process and how much they incorporate the couple's requests when creating the playlist. Remember, the vendors on your venue's preferred list may have a good reputation, but that doesn't mean you'll get along with them or like their style. A wedding is a significant investment and it's important that you're completely happy with every vendor you choose. Take your time, do your research, and only book a vendor when you feel 100 percent confident that they're the right one for your big day. 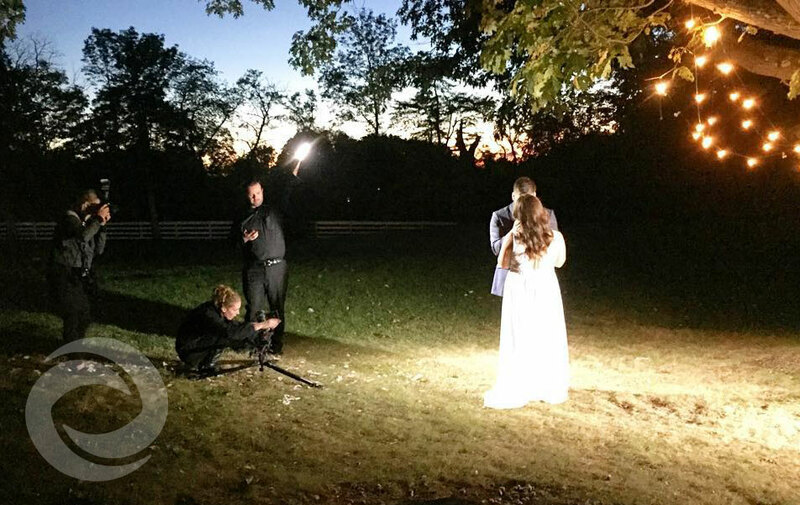 Whether we're on your venue's preferred vendor list or not, Hurricane Productions wants to help make your wedding day truly unforgettable. Visit our pricing page or get in touch with us for a custom quote on our wedding media and entertainment services.